I realize that anything with the word saga in it sounds terribly dramatic. So sorry, but today is not about drama–simply some practical news! My personal facial skin care product search continues to leave me quite happy with my Plantscriptions discovery! But today’s real news is about a product that lives on many store shelves in a plain wrapper of sorts. You may know it, or you have passed it by on numerous occasions. I visit the local Target about once a month for purposes of what we call our “monthly” shopping–that is, pharmaceuticals, paper products, vitamins, you know–that kind of thing. Generally, these items are less expensive there than at the local Walgreens, CVS or Grocery Store. 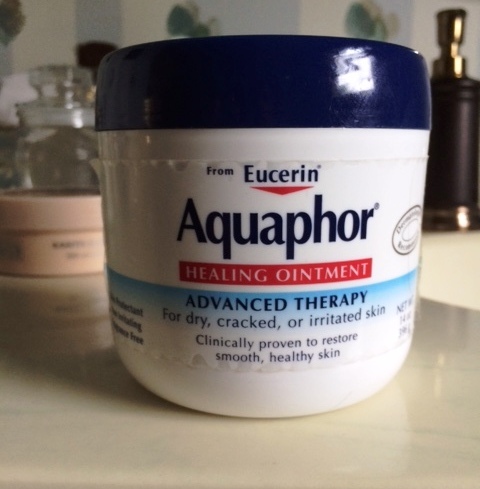 Back to Aquaphor–the super-hero of skin softening! Only after reading about this product in a variety of “the best of” lists, did I even think about searching it out. Initially, I thought it was a bit pricey for such an un-glamorous container of what appeared to be a vaseline clone. Nevertheless, I put it to the test on the two toughest body surfaces I know–my elbows and the bottom of my feet. Let me just say, I have the smoothest elbows an softest feet around! In fact, when I go for my annual pedicure, the clinician cannot believe the fabulous condition of my feet. This is what I do–after my shower, I massage in a dab or so of Aquaphor into the area aforementioned. At first, it feels a bit greasy and instantly, product is absorbed. DISCLAIMER–I am not a spokesperson nor do I receive anything in return for this report! I just really like the product and wanted to share ♥. What are your superhero products?